So who are exactly Future Prophecy (FP)? Though you already released 4 album, you've remained quite unknown- present yourselves. We are Hagay (25), software engineering student, and Itay (23), a student and a manger of a production company. Two brothers leaving in the capital of the Negev desert, Be'er-Sheva. We both started our musical way in the Forum club in Be'er Sheva, Hagay was a DJ (first 80s' music, electronic stuff, and then trance), and Itay was working with lights and also DJing from time to time. Our development is part of the general development in music in general. We don't have a very electronic background. We arrived at trance when a friend brought us a tape, and we listened to it in the car. At first we were not too enthusiastic about it, but what drew us to it immediately was the bass. We always loved music and we have tons of stuff at home of all kinds and genres. We like most Pink Floyd, Aviv Geffen, and a lot of alternative rock. How would you define your music's development from the first album to the one just released? Our first album (Future Prophecy) was released about six months after we signed up with Helicon, and seven months after we first touched this kind of equipment. It was actually an album in which we first felt the electronic experience. The second album (Seeds of Rage) didn't take long to come (about 8 months after the first), and had our big hit "Indra" that was heavily played all over the world. In this album we really connected more to the scene, and started to get better understanding in the technical aspect, about errors we've made, and also generally speaking. At that point we understood better where we're heading in trance and in general. A year later Shadows was released. We got real good reviews about it, and we feel that in this album we made a deep change in production and concept. We first remixed a famous act (X-Dream) in this album. The fourth album, the last so far, took a year and a half more to come out, after hard work and searching and looking inside ourselves. Tell us about the new album- Freak? We refrain from judging ourselves musically and leave that to the experts, but technically and emotionally, we feel a development in the present and also for the near future. A lot of work was put into this project, we sealed ourselves to music for six months, went into ourselves, and worked on our music- we can say that every sound in this one is the fruit of our own work and labor. What are your expectations from this one? Like every expectation derived from a positive feeling and a lot of hard work. It is impossible to overlook the massive influence X-Dream have on you, It can be felt from the second CD, and more so in the third and in this one. You have also remixed two X-Dream tracks, made one with COP and another with Marcus in the new CD- tell us about your relation with one of the strongest and biggest groups in trance- how did you connect with their music, how did you get into personal relations with them, and about the musical cooperation. Itay has always loved X-Dream very much. Before he went to India few years ago, we sat down to record some music, X-Dream among it. The tracks Hagay got connected to were Freak and Second Room. Hagay was just working on a track that really went very well together with Freak, so he decided to make it as a remix. One of the times he was DJing at the Forum club, he played it. Dino Psaras who was also playing that evening, got hooked up on it and asked to record it. He sometime later met with X-Dream, and played them the track. In one of the times they were playing at the Forum, the club asked Hagay to construct their live studio for the show. He played the remix on the sound system while checking it, and X-Dream recognized the track, and asked him if he knows who is Hagay who made it- he knew. They were enthusiastic about it and a good connection was formed. Hagay brought them to play in Israel, and we played with them in 4 parties. They came to visit in our house, heard our music and liked the way we thought. We asked to remix Second Room (released in Future Navigators II), and they agreed, heard it, liked it, and authorized. In one of the times we sat together in our studio we did a few things with Philip Weiss from COP, and few others with Marcus, we went on and finished the tracks, and so came out Future COP (UFS2) and Over the Edge. Don't you feel that this likeness to X-Dream obscures you musical identity- aren't you afraid that people will say: "that's just X-Dream imitation"? Every artist arrives from somewhere and lives in a certain environment that portrays and gives him tools to choose how he himself wants to be. We also have our sources from which we get our inspiration and learn, and one of them is X-Dream. Saying we are an "imitation" to a group like X-Dream is untrue and is unappreciative to the work and investment we put in the music we create. We love and appreciate X-Dream, but we have no pretensions to be them, and we think that it is time we get appreciated as musicians on our own accord, and not as anybody's shadows. As we said, what drew us to trance was the strong hard bass, we try to achieve it in our music as well and here maybe lies the likeness. We don't feel obligated to persuade anybody that our music is original, every artist has his uniqueness and so do we. And anyway that is all we want to say about this subject really. You're from Be'er-Sheva- in Israeli trance history, it has a distinguished place- BLT, P.Cok and more, besides you- anything special there? The desert capital has a nice records in Israeli music generally, and not only from this genre. Maybe the reason being that live in the province has advantages like peace and warmth that enables art of all kinds. Alternative rock, Pink Floyd, Suede, it might not manifest itself in the studio, but it's somewhere there in the background, and might be more felt in the future. We hardly listen to trance. Hagay is usually into Pink Floyd, and Itay has a passion for Brian Eno. 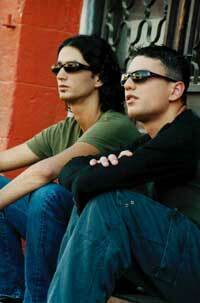 In trance Moksha are good friends, and we like their music. Tell us how is a track made. We make tracks spontaneously, building it very carefully, and choosing the sounds very carefully. The work is done with Hagay as the main writer and he builds the sounds. Itay is the mind behind the track and its direction. The tracks' names don't mean much to us, and actually the label manager gives the names to the tracks. All and all a lot of things influence us and our musical creation. It seems that though you are releasing very strong dancfloor material, you don't play a lot in parties, why? Is this going to change? It was probably a matter of marketing. Probably the way in which we were marketed till this album didn't match our needs. We are now working with our label manager and the label's P&R to change that. What are your plans for the near and far future? Like every one we have our own ambitions to reach goals we set for ourselves in the musical and personal fields. A few club trance tracks we made are going to be released in different compilations soon. For the future we expect to take part in big productions in other scenes and music genres. We also want to do things more in tune with the intro to the new album, vocal work. Hagay is even working right now on a track with himself on the vocal part.